The home recording equipment you need will depend on what you want to record. If you want to record vocals, guitar or live sound then you will need audio recording equipment a microphone, preamp, mixer etc. For digital recording equipment you will need a keyboard and synthesizer. Below is a list of the professional recording equipment you can use with a brief description of its use. Click on each piece of equipment for a detailed description of its use. 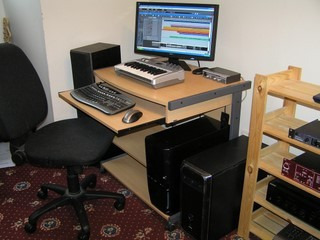 The computer is used to store the recordingas well as perform all functions in the DAW. This is like a tape recorder in software form. Use it to record, edit, mix and add effects. Use this to get the music from the microphone into the computer. You can listen to what you have recorded with monitors. Amplifies the music from the computer to the monitors. Creates an electrical signal from the instrument. Amplifies the music from the microphone to the computer. Record two or more instruments at a time and add in effects. To input notes into the computer. Synthesizers create sound, you can create any sound you want. Samplers lets you record one note of an instrument and use that note to create a song. Lets you apply effects and dynamics to your music. Used to stop sound from bouncing off walls back to the microphone. The computer recording equipment you need will depend on what you're recording, but to start, a computer, DAW, monitor, microphone, preamp and audio interface/soundcard is all you will need. If you invest in a flagship DAW like Cubase 7.5 or Sonar x3 then you will have the other pieces of equipment in software form which will work fine in your recordings. For professional recording equipment, you need to get the hardware, and you will get the best results. But it will be more expensive so take your time and add one piece at a time. Then you can have, The Best home recording equipment.